Osteoarthritis of the base of the thumb is a very common condition particularly over the age of 50 years. Approximately 40% of post-menopausal females have radiographic changes at the base of the thumb, 10% seek medical treatment and 1% are severely afflicted. Base of thumb OA is more common in females than males and is usually starts over 50 years of age. usually as a result of a previous fracture. There are two types of OA. Primary and Secondary. Primary OA is the most common cause and is simple wear and tear. Abnormal loads across the joint cause the articular cartilage (slippy ends of bones) to wear away, leaving bone on bone ends rubbing together. Secondary OA occurs often after a fracture into the joint causing a sharp bone surfaces to rub and wear the joint away. Well-localised pain at the base of the thumb is the most common sympton. Provoking activities include the unscrewing of jars, and pinch grip and turning a key using the thumb often cause pain. Bony swelling is apparent at the base of the thumb in more advanced cases and local palpation at the base of the thumb is tender. Specific tests include the Axial Grind Test, whereby the thumb is pushed along its long axis towards the base of the thumb. Reduction Relocation test involves pressing the base of the thumb joint with one hand whilst circumducting the end of the thumb with the other hand. X-rays of the thumb reveal the typical features of loss of joint space and osteophyte (extra bone) formation. I often obtain three X-ray views : a thumb CMCJ AP (Robert View) and a AP and Lateral Wrist. The lateral wrist helps me look at the alignment of the wrist bones and in particular the lunate bone to make sure there is no co existing ligament attenuation in the wrist. The Robert view is the best view to see the joint and notice the abnormal surfaces. - Rest, pain killers (analgesia) and avoidance of provoking activities. Approximately half the patients I see have joints that are easy to palpate and I inject them in clinic. However the other half are more difficult and require the injection to be performed under X-ray control. I only perform one or two injections before considering surgery. The risks associated with steroid injection are small but include, failure to give long lasting benefit and a small risk of causing a skin reaction with altered skin pigmentation or in severe cases thinning of the fat under the skin. If non-operative techniques have been tried and have not given long-lasting benefit some patients may elect to undergo surgery. The aim of surgery is to prevent the two ends of the bone from rubbing against each other. I would always discuss the options available and these may be guided by the patients age and functional demands. The decision about which particular surgery is the most appropriate for an individual patient is made having considered the functional demands of the patient and the preoperative X-ray. Surgery is performed under general anaesthetic or regional anaesthesia (only the arm is made numb). Each of the surgeries listed above take between 30 and 40 minutes. The skin is sutured with absorbable buried stitches and an immobilised with a half Plaster of Paris slab applied. In the past having removed the trapezium I used to perform ligament reconstructions, fill the space with rolled up tendon or perform a sling type procedure. However having studies the literature I now simply remove the trapezium and repair the joint capsule. The space that is left seems to fill with scar tissue and the results in my practice tho no difference over the more involved sling / reconstruction type procedures. One of the main risks of trapeziectomy is proximal migration of the thumb metacarpal. If this occurs it can very difficult to stabilise the thumb and ultimately may require a procedure to fuse the thumb metacarpal to the index metacarpal which is a difficult operation. Proximal migration would be a major concern in a younger individual and in such cases most people would prefer a thumb CMCJ fusion or a total joint replacement. under 50 yrs of age. The ends of the bone are removed with a small saw and then brought together and held with two staples. Over the next 6 weeks or so the bone grows across the joint and abolishes any movement and hence pain that was present at the joint. The thumb is somewhat stiffer than normal and patients will not be able to contour their dumb flat against a table. Most do not consider this a problem and are happy that the thumb is pain free and strong. This is a relatively new concept in the UK but very popular in Europe. The ends of the bone are removed and a new joint is inserted very similar to a mini hip replacement. The results are very good and I am increasingly offering this as an alternative. I am a paid advisor to Stryker in the development of the Moovis thumb cmcj replacement. Please click on this link to view an actual operation showing how the joint moves. The patient is fit to go home soon after the operation usually on the same day. Simple analgesia usually controls the pain postoperatively and should be started on discharge. The hand should be elevated as much as possible for the first 5 days to preventswelling in the hand and fingers. Gently bend and straighten the fingers from day 1. The back slab Plaster of Paris is removed in the first week when the wound is cleaned, redressed and a therapy made splint (cast) is applied. The sutures are usually dissolvable and buried under the skin. The splint (cast) is kept for approximately 6-8 weeks. Therapy exercises will commence to regain mobility and strength. Patients usually notice that the arthritic pain has gone within 8 weeks but the results improve between 6 and 12 months as the thumb strengthens. The wounds should be kept covered and dry for the first 10days until the wound has healed. The splint or cast should be kept dry and this can be gradually removed with the supervision of my hand therapist. Return to driving: The hand needs to have full control of the steering wheel and left hand the gear stick. It is probable advisable to delay return to driving until you are pain free and can control a car in an emergency. This may be between 8 and 12 weeks, although everyone is different and some patients feel safe to drive within a few weeks. Return to work: Everyone is involved in different working environments. Return to heavy manual labour should be prevented for approximately 8weeks. Please ask your surgeon for advice on this. Overall, greater than 85% are happy with the result. However complications can occur. There are complications specific to thumb surgery and also general complications associated with hand surgery. Failure to completely resolve the symptoms (this may be due to arthritis in adjacent joints, this should be rare but may require further surgery). The thumb will be weaker on the opposite side, which should improve with time, but will never be normal. Proximal migration of the thumb metacarpal (5%).​ This can occur after a trapeziectomy when the thumb metacarpal drops down into the space left once the trapezium has been removed. It can be improved using a sling type procedure to hold up the thumb or the thumb be fused. 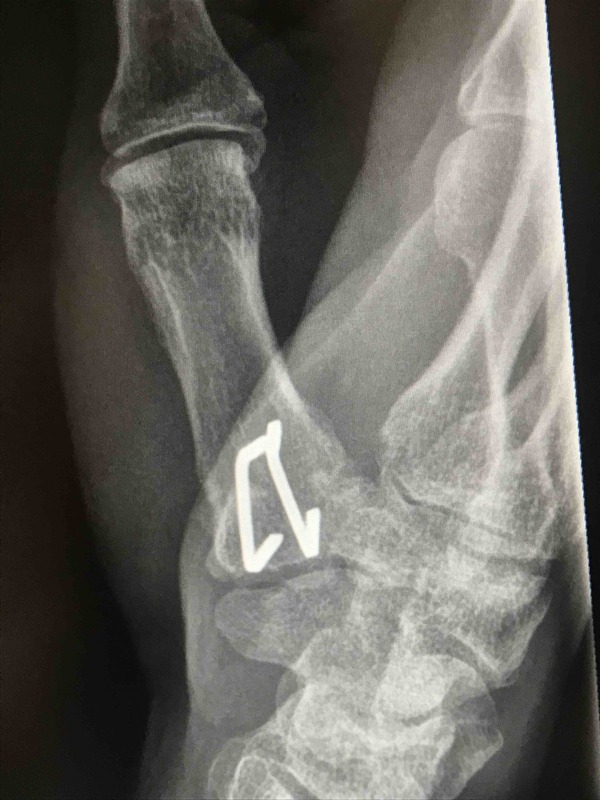 Dislocation (5% - 10% when an implant is used), occasionally, when an implant is used there is the risk of dislocation, but the theoretical benefit is of a stronger thumb. If it dislocates it may need to be removed and the space dealt with as in other operations.